Thanksgiving presents an opportunity for vegans to share their passion for food with friends and family. Vegans are turkey lovers in their own way, but they might have reservations about a holiday bird roast Americans casually refer to as Turkey Day. A long time ago, turkey became associated with giving thanks for a successful harvest. History lessons aside, what’s way more important to us today is that vegans feel comfortable participating in meat-based American holidays like Thanksgiving. Explaining your dietary choices to family members who may have watched you eat meat for a part of your life is a challenge. But giving thanks has nothing to do with eating turkey and everything to do with family and friends (and cruelty-free pumpkin pie). Colonial Americans reshaped their diets around the ingredients available to them in the new world. Unfortunately, that happened without much consideration for the animals involved. This meant that a bountiful harvest was celebrated with what they called “wild fowl” at the time. Wild fowl translates to turkey for modern Americans, and at the time, turkey had two things going for it. It was a good source of protein and easy for colonists to hunt. Nowadays, two turkeys are pardoned in the name of the long-standing tradition now responsible for 46 million turkeys killed for Thanksgiving in America every year. Most Americans don’t participate in the Thanksgiving harvest anymore, nor do they hunt their own bird. Turkeys spend their lives on factory farms to be shrink-wrapped and sold in supermarkets by the pound. Days later, we present their dead bodies to a room full of eager carnivores, many of whom ran in the morning and fasted all day to make room for more turkey. Thanksgiving presents a challenge for everyone abstaining from the tradition of roasting and eating a turkey, especially if there will be a bird in the oven at your holiday celebration. Marshmallow, Yam, Biscuits, Gravy, Flyer, Fryer, Apple, Cider. These turkeys, crudely named after traditional Thanksgiving dishes, were pardoned by various U.S. presidents over the past 20 years. Since 2005, pardoned turkeys went to live in Disneyland. “I know that Marshmallow and Yam are going to feel pretty good strutting around sunny California remembering the cold days of Minnesota,” said President George W. Bush, whose father was the first to pardon his turkeys. That year, animal welfare groups raised concerns about the birds’ life after pardon. Prior to Bush’s last Thanksgiving Day celebration, the sitting president sent the turkeys to petting zoos in Virginia. Turkey names are chosen on the White House website by popular vote, which goes to show how hungry Americans are for their Thanksgiving feast. In an interesting change of pace, the Obama turkeys took on a patriotic, get-up-and-wave-the-American-flag tone at first. Then they slowly devolved into a hungry mess: Courage, Liberty, Peace… Cobbler, Gobbler, Mac, Cheese, Tater, Tot. It gets worse. Trump’s turkeys Drumstick and Wishbone were presented to the nation alongside two slaughtered turkeys as if we needed another primer from the current administration on how cruelty works. The idea of turkey pardon is one part ridiculous and two parts terribly righteous. Manners are the only thing we pardon outside the context of criminal activity. But the President’s pardoning of two turkeys captures the attention of the entire nation every year. Meanwhile, huge bird balloons float through New York City in their honor. Pardon me, but did 46 million turkeys really have to die to celebrate the imaginary harvest almost none of us participated in? Turkey isn’t the whole meal, and the meal isn’t the whole Thanksgiving. The holiday is a celebration of giving thanks, and anyone can do that, regardless of their dietary restrictions. Although, non-vegans should acknowledge that Thanksgiving can be hard for vegans. There’s a necessary dread in showing up to a fight you know you’re going to lose. But maybe it’s not about winning or losing at Thanksgiving. Maybe it’s just about giving thanks for the opportunity we all have to sit down with friends and family. Try sharing a meal together without the food politics. Choosing not to deliver a vegan sermon at the dinner table might be more powerful than actually giving one. There’s a time and place to help people change their ways. The Thanksgiving dinner table is not it. But Thanksgiving does present an opportunity for vegans to share their passion for food with friends and family. Vegans are turkey lovers in their own way, but they might have reservations about a holiday bird roast Americans casually refer to as Turkey Day. For new vegans, more often than not, a day of meat eating around family can be a recipe for disaster. The people who spent years living with you, watching you eat meat, watching you eat turkey on Thanksgiving, now have to sit quietly and listen while you explain that you will not be eating turkey this year. Remember, this is not the time to challenge your sibling’s decisions to eat meat or not eat meat. Your vegan friends don’t want to hear how good your meat tastes. This is the time for everyone to remember that Thanksgiving is for vegans, too. Traders Joes is leading the way with all of these amazing vegan options for your Thanksgiving feast. Wait… there’s more! Dream up your own vegan feast delivered to your front door with this plant-based Amazon shopping list. For vegans, there’s still hope and lots of tasty vegan dishes to bring to the table. Sometimes, you can even trick your family into eating vegan. Add creamed spinach and this pumpkin pie recipe to your impressive plant-based Thanksgiving offerings, and you’re sure to receive some praise when everyone digs in. No matter how hard we try, on Thanksgiving day we will all sit down to the table with different tastes. And that’s okay. Thanksgiving can be about the people and the food we all bring to the table. Is Using Science to Help Animals Adapt to Life on Factory Farms Ever the Solution? How Many Animals Are Killed for Food Every Day? 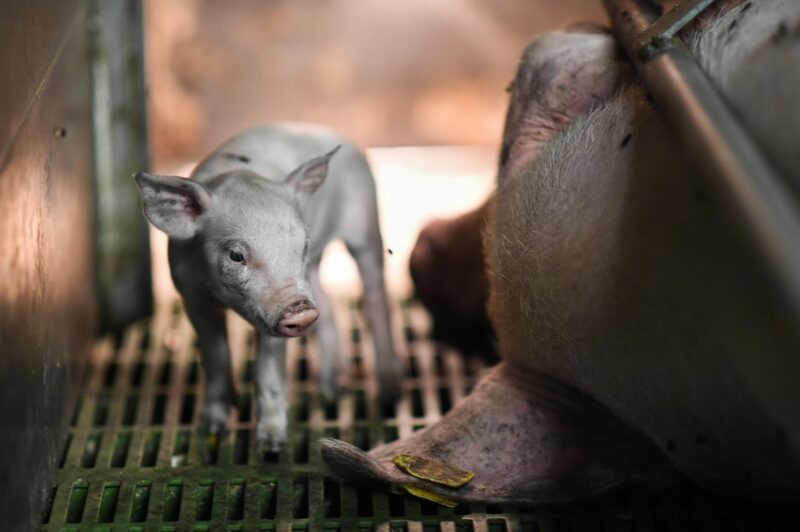 North Carolina has been and still is a hub for some of the most restrictive and controversial laws in the country, including those favoring the animal ag industry.